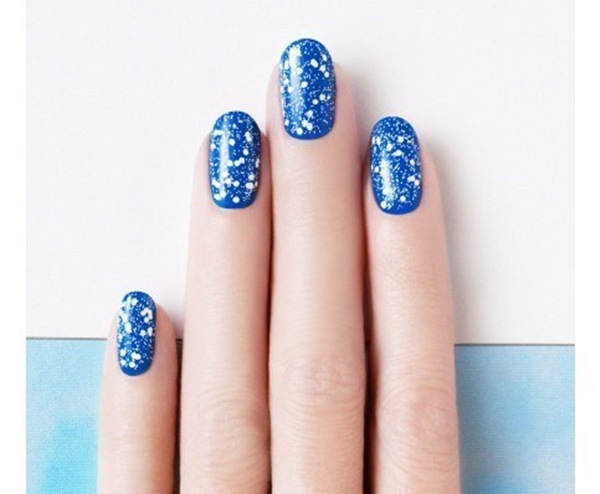 You don’t have to sport super long nails to pull off some of the latest nail design trends. Most designs work just as well on shorter lengths. Based on trends we’re seeing for fall, short nails are here to stay. The Squoval nail, especially popular for fall 2015, has a square shape with rounded edges. Here are some easy and fun designs that all will look great on short nails. Some of these designs look pretty intricate, but actually require nothing beyond the polish and tools you have handy at home. So get creative and jump right in! 1. 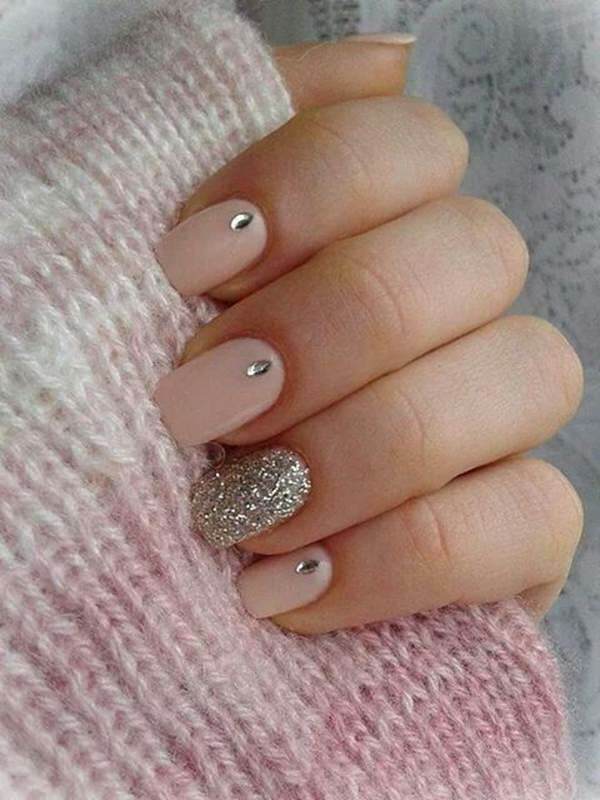 Pretty in Pink: Feminine with a bit of bling, this design incorporates the metallic trend that is so big for fall with pale pink, almost natural nails. Coordinate your ring finger color with the gems centered at the base of each nail. For easy to use rhinestones, we suggest Zodaca Nail Art Rhinestones, great for both natural and artificial nails. Silver and gold both work well for this design. 2. Punky Polka-Dots: Black polka-dots make this pink manicure a bit funkier than usual. 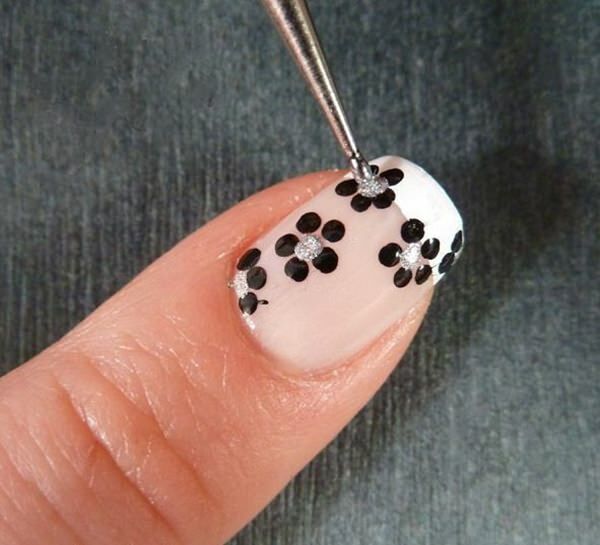 You can use professional nail art brushes and dotting tools to create this simple art. If you don’t have these tools, the rounded tip of a bobby pin or a toothpick will work just as well. Always finish with a high-gloss top coat. This design would work in countless other color combinations. 3. 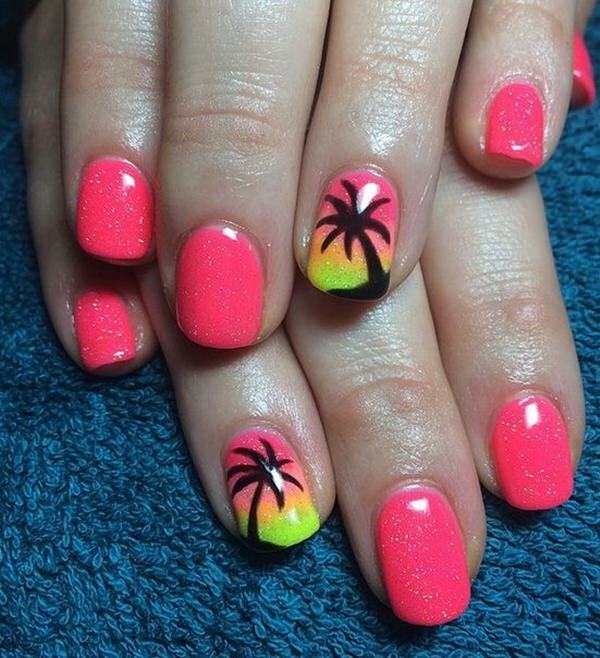 Summer Lovin’: Make summer last as long as possible with this tropical nail design. Begin with a bright coral or peach polish on all nails. For your ring finger nails, add muted strips of orange and yellow as you get closer to the nail tip. This will create a subtle sunset. Use a black nail art pen to draw the palm trees. Complete your island look with a glitter top coat and you will be dreaming of margaritas for weeks. 4. New Neons: Traditional French manicures might seem a bit blah with all of the options available these days. 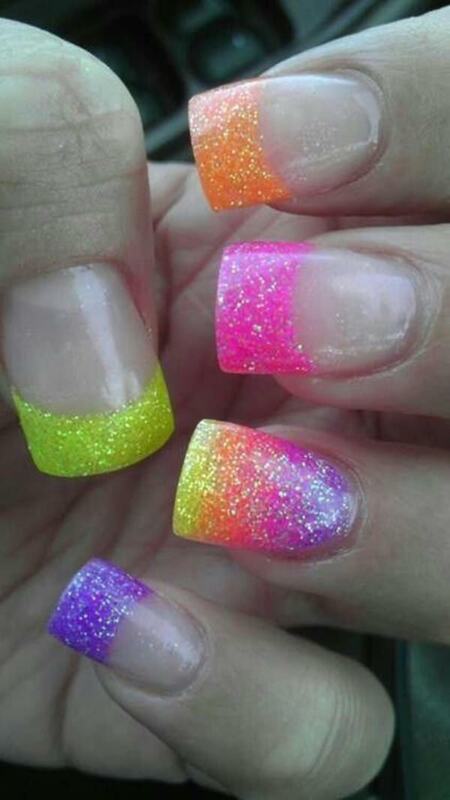 Here’s a bright and beautiful take on the French manicure with a natural base and a different neon shade on each tip. For extra oomph, create a rainbow effect on your ring finger nail by gradually using lighter shades as you move out from the cuticle. Seal with a sparkly top coat. Shinespark Nail Polish makes our favorite day-glo brights with their 80’s Neon Collection. 5. Happy Birthday to You: Celebrate your birthday or any special occasion with these sweet treats. For this look you need flat white polish, and four alternating pastel shades for the cupcake wrappers. 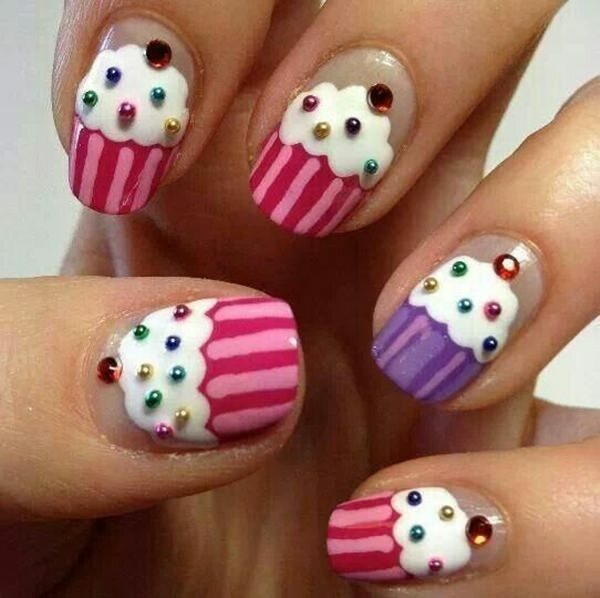 Use a thin nail brush to create the cupcake frosting, and nail art pens to create the striped wrappers. Apply “sprinkles” or nail art gems with tweezers. Seal this 3-D design with two coats of a sturdy top coat. This look is prefect for the little girl in your life. We love Claire’s Nail Kit which includes rhinestones, nail tape, dotting pens and brushes so your little girl can create her very own masterpieces! 6. When You Wish Upon a Star: This is an easy design for the girl planning her trip to the Magic Kingdom, or maybe just showing her love for all things Disney. 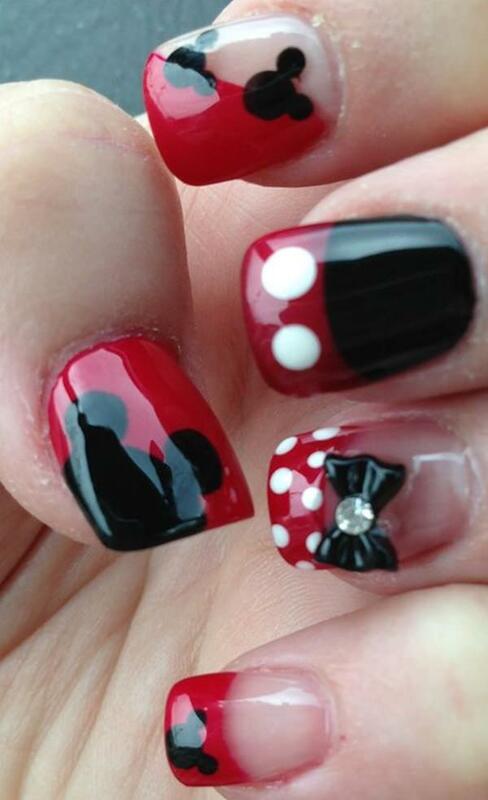 Each nail is a nod to Mickey and Minnie, from their famous mouse ears to the perfect polka dots on Minnie’s dress. You can find three-dimensional bows at your local beauty supply store or online for as little at $.10 each! If a different design on each nail is too much look for you, pick a favorite and repeat that on each nail. 7. 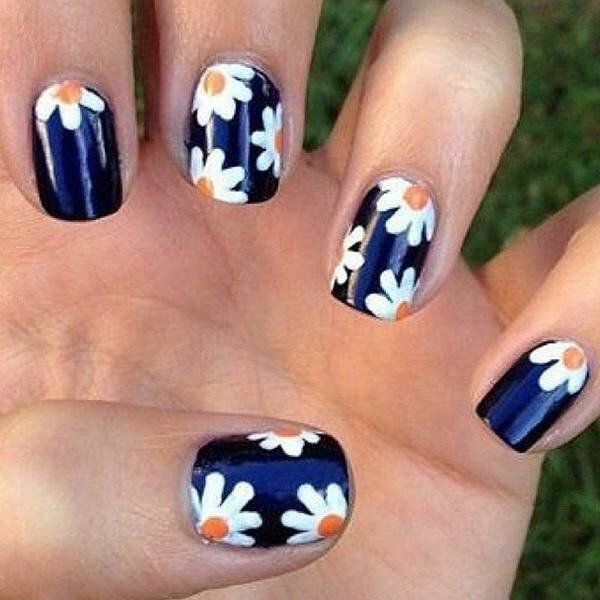 Fresh as a Daisy: This is a fairly easy freehand design that you can vary from nail to nail. After applying two coats of a dark base, freehand white daises using white polish and a nail art pen for neater edges. Dab a dot of yellow or orange in the center of each nail and finish with high-shine top coat. Like a bouquet, every flower will be different – so you can’t mess up! Any base color will work as long as it’s dark enough to contrast the bright white daisies. 8. There’s More to This French Mani: Here’s yet another way to update a stuffy French manicure. Scatter flowers across each nail in random patterns. Darker petals work best over the light and natural look of the French manicure. For more sparkle, dab the center of each flower with a sparkly gold or silver polish. Use professional dotting tools to make uniform petals. If you don’t have any available, the end of a make-up brush or cotton swab will work just as well. 9. Moody Matte: Matte nails were all over the runways for fall 2015. There are a ton of online tutorials on how to create your own matte nail color, but we think using a matte top coat as the easiest option. 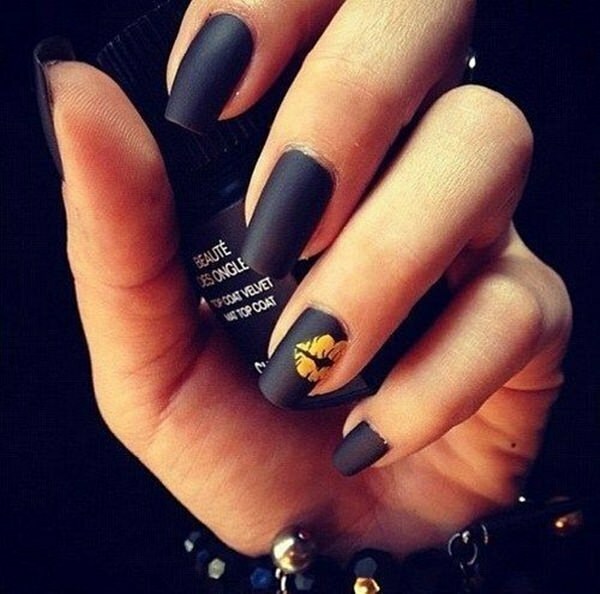 Matte nails are most dramatic in the dark, Goth shades that are going to be popular in the months to come: grays, berries and browns. 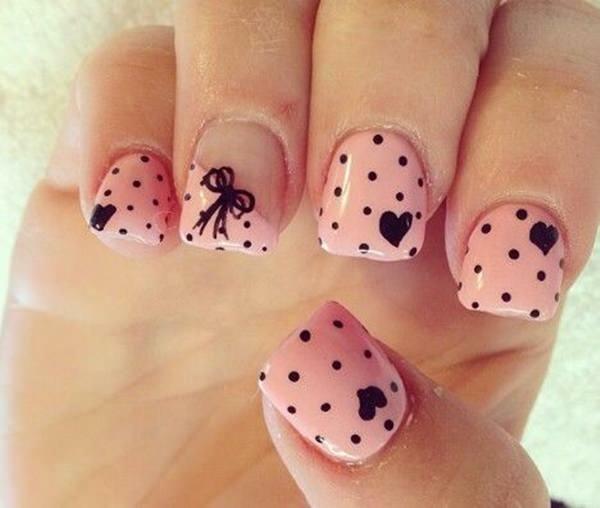 To add personality to one nail, try a simple nail art decal found at any beauty supply store. Always apply your decals before your top coat to prevent chipping or peeling. The best matte top coat we’ve used is Rescue Beauty Lounge’s Matte Top Coat. It adds a flat finish without changing the color underneath. 10. Abstract Art: Some of the easiest nail art designs to reproduce are the random, imperfect designs like the splatter effect in this manicure. To create this look, use two contrasting colors. You can use a light base splattered with a darker shade, or try the opposite. Either way, allow the base coat to dry completely. Use scotch tape to cover the tip of your finger, leaving only the nail exposed. Use a few drops of water to make your acrylic contrasting polish a bit thinner and easy to splatter. Create your design by gently shaking the brush over your nails. There is no way to mess this part up! Allow your nails to dry before sealing with a top coat.